Introducing the new Bernina 580E sewing machine with embroidery unit, the top of the range model of the new Bernina 5 Series range of sewing machine. The new Bernina 580 includes a library of over 200 stitches. 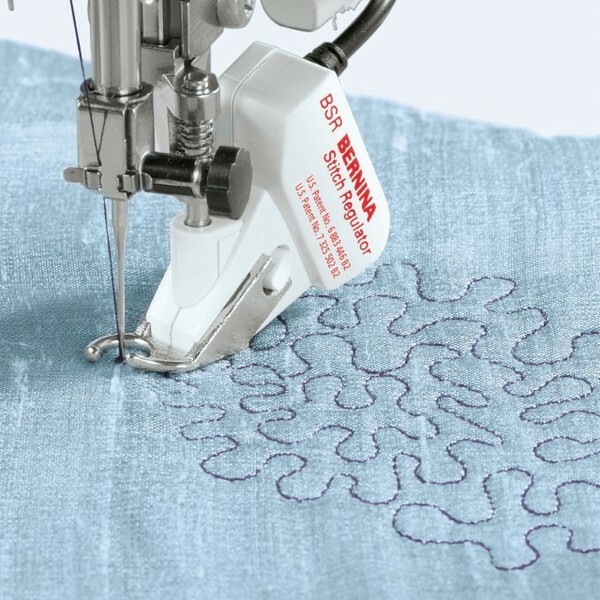 The unique Bernina Free Hand System (FHS) comes as standard with the Bernina 580, the FHS raises and lowers the presser foot whilst releasing thread tension and lowering the feed dog, leaving your hands free. The Bernina 580 was designed with your sewing and embroidery future in mind and a variety of special accessories and feet are included with the machine. The Bernina 580 will wow you with its simple yet classic design. This part of the online tutorial will teach you how to set up your BERNINA 580, 570 QE or 560 sewing machine for embroidery. Attach the embroidery module and insert the embroidery bobbincase. Place the fabric in the hoop. 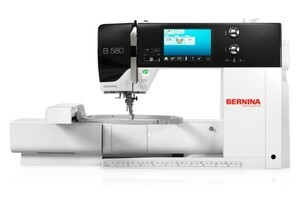 For further information about the embroidery module and the new BERNINA 5 series have a look at www.bernina.com/5series. In this video tutorial, we use a BERNINA 580 to demonstrate the different steps. Not all machine models mentioned in the title and description of this video offer all features and functions shown in the video. Bernina 580E With Embroidery Unit Computerized Embroidery Sewing Machine. – for the perfect sewing result Built-in embroidery function NEW: BERNINA Stitch Regulator inclusive High-resolution, modern touchscreen Versatile memory function Large stitch package and a wealth of built-in embroidery designs. *The patented BSR is a truly special high-tech presser foot that ensures top-quality stitching when free-motion quilting. When you sew with the BSR and lowered feed dog, your stitch length remains exactly the same all the time, even if the fabric is not always fed at the same speed. The BSR compensates for inconsistency in speed, so that straight and zigzag stitches are always the exact same length. Even those who are relatively inexperienced at free-motion sewing can reliably achieve high-quality results with the BERNINA 580. *Up to 24 Months GE Synchrony Bank Fixed Payment No Interest Financing with approved credit! Free, 6-hour, in-store, classes with purchase of each Bernina machine taught by certified a Bernina Instructor. Ask your in-store associate for details. All in-store repairs done by certified technicians. Let your B 580 keep track of the details with multiple memory functions. It remembers the changes you make to the stitches as you use them in your sewing session. It will also remember your favorite stitch settings for each stitch in a long-term memory. For creative applications, you can save multiple combinations of sewing stitches as well as embroidery compositions in memory. Combination memory and the My Designs folder keeps you organized. The BERNINA 580 provides an exclusive level of stitch control. Whether altering the stitch length (up to 5 mm), width (up to 9 mm) or needle position (up to 11) or even creating custom combinations, you'll appreciate the convenience of a machine that remembers the stitch details for you. The BERNINA 580 sewing and embroidery machine is simplicity in itself. The clear and easy to navigate color touch screen gives you access to hundreds of stitch options and beautiful built-in embroidery designs. Onscreen editing features for sewing and embroidery provide even more design flexibility. You will have everything you need to set your imagination free. The B 580 includes a library of over 200 stitches, conveniently stored by category for a wide variety of applications, including the one step automatic buttonhole function - for consistent buttonhole length time after time. Whatever your sewing project, you'll find the perfect stitch. Over 100 high quality embroidery designs are built right in, along with seven elegant fonts for personalizing your projects. Mirror image, rotate, combine and resize designs right on the embroidery screen. Expand your embroidery library with additional designs imported to the machine via the USB port. You'll appreciate the user friendly features and simple interface. The high resolution color touch screen displays all your settings at a glance. The built-in Sewing and Embroidery Consultant is ready to assist you at anytime. The practical semi-automatic needle threader lets you start sewing faster. With the BERNINA 580 you'll spend more of your valuable time sewing, quilting and embroidering. Unique to BERNINA, the Free Hand System (FHS) comes standard with the B 580. The FHS raises and lowers the presser foot while releasing thread tension and lowering the feed dog, leaving your hands free to guide your project. Also included is a practical extension table with ample space to hold your larger sewing projects. The Bernina 580 comes with a wide range of accessories and presser feet as standard. What's more, the machines can be upgraded with further sewing, embroidery and quilting accessories as your skills and requirements grow. Wide selection of stitches, embroidery designs and functions. Whatever you wish to sew or embellish, the BERNINA 580 puts a wide range of stitches at your disposal. With 838 stitches in all, including 186 decorative stitches, you’ve got a generous selection from which to choose – and all stitches can be sewn up to a width of 9 mm, which is particularly attractive for embellishment. In addition, 7 alphabets for sewing and 7 alphabets for embroidery are at your fingertips. What’s more, the 100 embroidery designs can be accessed in a separate embroidery mode and adapted on the touchscreen: rotating, mirroring, sizing up or down or altering the stitch pattern are quickly accomplished, thanks to the 580’s intuitive operation. Using the memory function, it’s a cinch to permanently save your customized stitches and embroidery designs. Intuitive operation via the high-resolution touchscreen Unique in the 5 Series line, the BERNINA 580 boasts a large bright touchscreen affording quick access to its wide range of features and functions. Large descriptive icons ensure easy access to the desired BERNINA 580 function. 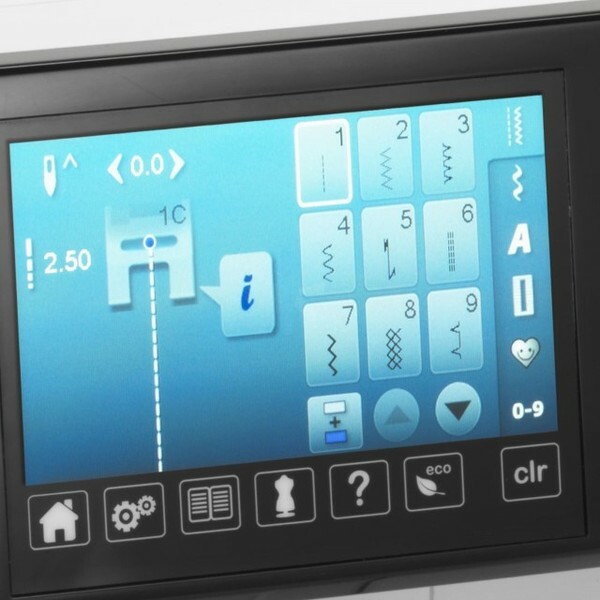 The intuitive touchscreen allows for efficient operation of the BERNINA 580, making look-up in the manual unnecessary and allowing even fairly inexperienced sewers to switch quickly between the different stitches, stitch patterns, embroidery designs and functions of the BERNINA 580. Built-in BERNINA Stitch Regulator (BSR). The patented BSR is a truly special high-tech presser foot that ensures top-quality stitching when free-motion quilting. When you sew with the BSR and lowered feed dog, your stitch length remains exactly the same all the time, even if the fabric is not always fed at the same speed. The BSR compensates for inconsistency in speed, so that straight and zigzag stitches are always the exact same length. Even those who are relatively inexperienced at free-motion sewing can reliably achieve high-quality results with the BERNINA 580. Memory function for your own creative ideas. Thanks to the individual setting options of the BERNINA 580, stitches can be altered or combined in a wide variety of ways to suit your personal preference. With the BERNINA 580‘s intelligent memory function, these individual stitches, stitch patterns and stitch combinations remain set even after you turn off your machine, and are immediately available again the next time you turn the machine on. The generous 8MB memory provides the capacity for a large number of personal stitch combinations, letting you adapt the BERNINA 580’s library of stitches completely to your individual requirements. Impressive options that will enable and spark your creativity! From sewing to embroidering with a single click. The BERNINA 580 is factory-equipped with an embroidery function and comes with the embroidery module as standard. With 100 embroidery designs already built into the BERNINA 580’s software, you’ll have immediate access to a wide range of attractive designs for ambitious embroidery projects, which you can easily and quickly select via the touchscreen.The BERNINA 580’s combination of sewing and embroidery functionality lets you bring even more variety to your sewing projects. User-friendly menu navigation gives you quick access to all the important functions. The B 580 now includes an accessories box. All sewing tools such as presser feet, needles and bobbins can be stored in the convenient accessories box. There is even room for large presser feet, such as the buttonhole foot. The brackets for the feet are adjustable. The drawers also provide plenty of space for easy storage of smaller sewing tools. The accessories box is positioned securely on your sewing table with the retractable stand feet. 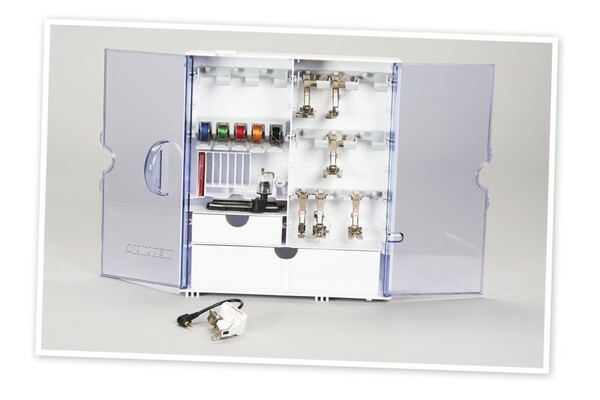 The transparent doors provide a clear overview of all your sewing tools. 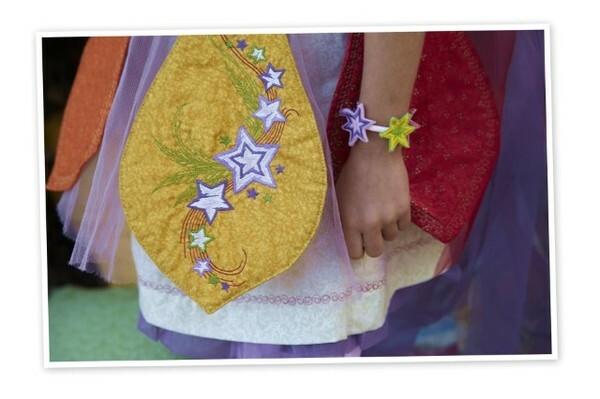 FROM SEWING TO EMBROIDERING WITH ONE CLICK. 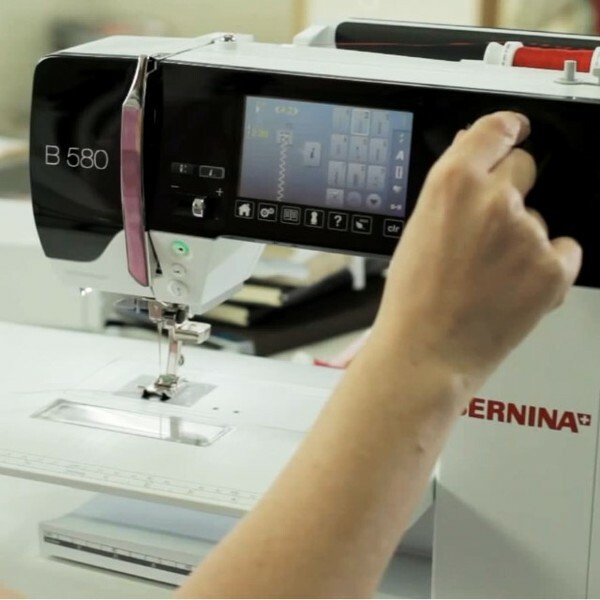 The BERNINA 580 is factory-equipped with an embroidery function and comes with the embroidery module as standard. With 100 embroidery designs already built into the BERNINA 580’s software, you’ll have immediate access to a wide range of attractive designs for ambitious embroidery projects, which you can easily and quickly select via the touchscreen.The BERNINA 580’s combination of sewing and embroidery functionality lets you bring even more variety to your sewing projects. User-friendly menu navigation gives you quick access to all the important functions.